What happened to Joe Mauer? Joe Mauer's accomplishments as a catcher through age 30 are nearly unmatched in the history of baseball. As a 23-year-old he became the first AL catcher to win a batting title, the first catcher in either league to win a batting title in six decades, and the first catcher in MLB history to lead all of baseball in batting average. As a 25-year-old he won another batting title and as a 26-year-old he became the first catcher in baseball history to win three batting titles. In that age-26 season he hit .365 with a .444 on-base percentage and .587 slugging percentage on the way to being named MVP. He was the first catcher in baseball history to lead the league in batting average, on-base percentage, and slugging percentage--the sabermetric triple crown--and his .365 batting average was the highest by any catcher since 1901. Mauer also made three other strong runs at batting titles, finishing third at age 27, fourth at age 29, and second at age 30. Unfortunately he's no longer a catcher, being forced to move out from behind the plate following an August 19, 2013 concussion that ended his 2013 season and left him with symptoms months into the offseason. 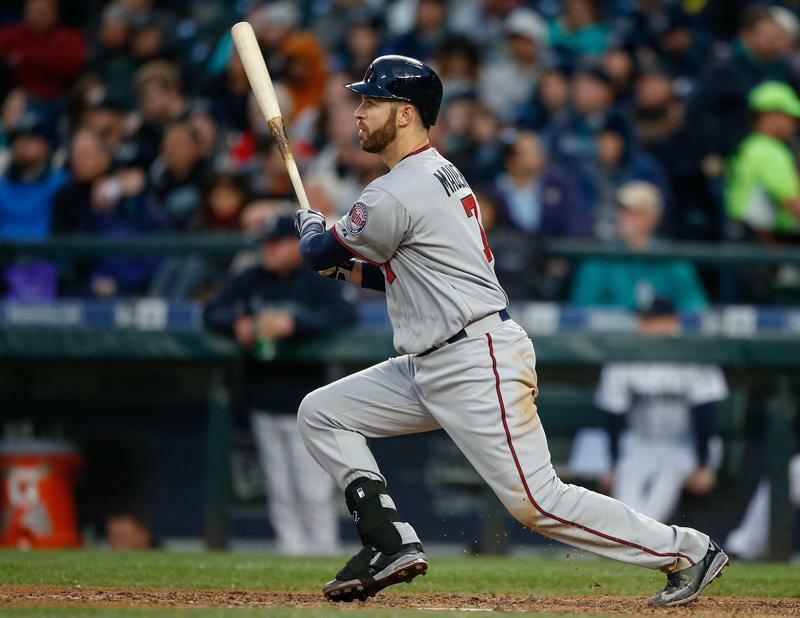 Mauer was given a clean bill of health for 2014 and switched positions, going from one end of the defensive spectrum to the other, but now he's a 32-year-old first baseman who looks like a shell of his former self. Mauer got off to a slow start last season, which is never unexpected for a player returning from a season-ending brain injury. When he started doing his usual .300-hitting, walk-drawing thing in June--and for the most part kept that up through the rest of the season despite being interrupted by a strained oblique muscle--it looked like Mauer was fully recovered from the concussion and ready to resume being an on-base machine in 2015. Optimism was further fueled by reports of Mauer working with hitting coach Tom Brunansky to be more aggressive at the plate and pull more pitches in an effort to unearth more power. There were some signs of progress early on this season, as Mauer turned on pitches and lined balls into right field and right-center field more often than he did previously, but his overall production has fallen even further from his underwhelming 2014 production. Mauer was having a typical Mauer season at the time of the concussion, hitting .324 with a .404 OBP and .476 SLG compared to his nearly identical .323/.405/.468 career mark from 2004-2012. He has not been the same hitter since, whether due to the lingering effects of a brain injury or to the normal effects of aging, the latter of which are often more rapid for longtime catchers. Mauer has hit .272 with a .348 OBP and .366 SLG in 178 games since the concussion. For a player whose hitting revolved so much around eyesight, handeye coordination, and reflexes rather than brute strength the possibility that the concussion still hurts Mauer by robbing even a fraction of those skills seems plausible. Whatever the case, the Twins now have a 32-year-old first baseman with more than $80 million remaining on his contract who has just narrowly managed to be an average all-around hitter for the past 178 games. Mauer has always lacked power, or at least power relative to his 6-foot-5 frame and unrealistic expectations for how he might develop into a perfect, flawless player, but even his modest power has vanished. Once good for a ton of doubles and 10-15 homers per season--including 28 homers in his MVP-winning 2009 campaign--Mauer has just six homers in 178 games since the beginning of 2014. Isolated power is a statistic that subtracts batting average from slugging percentage to show how much raw power is present. Mauer's isolated power since the concussion is .095. By comparison, his isolated power from 2004-2013 was .146 and dipped below .115 just once. 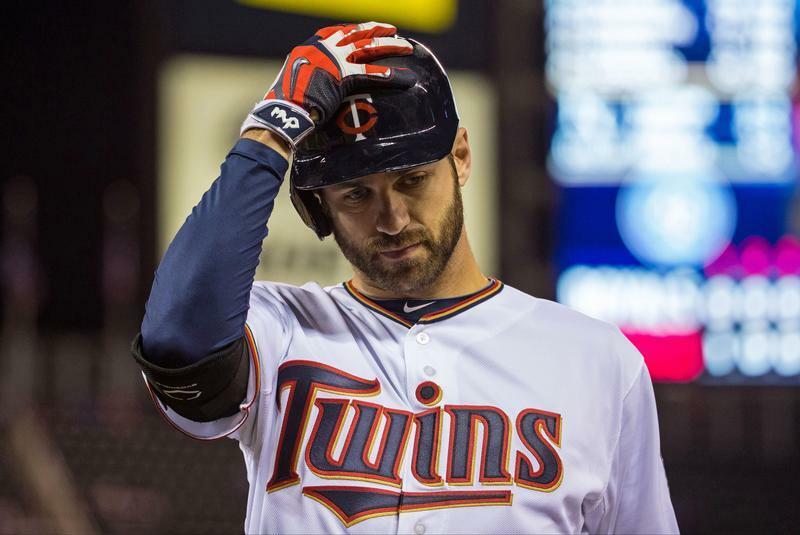 He has essentially lost half of his power since the concussion and the result is the type of player--a punchless singles hitter--that Mauer's critics often unfairly labeled him as throughout his career. Mauer's pre-concussion isolated power of .146 would have been among the worst by regular first basemen since 1995, but his post-concussion isolated power of .095 is basically unheard of at the position. There's a subset of left-handed-hitting, slick-fielding first basemen like James Loney, Casey Kotchman, and Doug Mientkiewicz that always seems to have a couple starters across MLB each season, but even those guys typically manage an isolated power in the .130 range. Mauer going from mediocre power to non-existent power would be somewhat easier to live with if he were still hitting .325 with tons of walks, but even that has changed. Mauer's strikeout rate was on the rise even before the concussion and since returning from the brain injury he's whiffed in 18 percent of his plate appearances compared to 11 percent from 2004-2013 and less than 10 percent in some of his best seasons. Whereas most players sacrifice strikeouts in the name of making harder contact Mauer's batting average on balls in play this season is a career-low .302 and his .328 batting average on balls in play since returning from the concussion is 20 points below his career mark. He's putting fewer balls in play and fewer of the balls he does put in play are dropping for hits, which is a very bad combination. After constant complaints that he's too passive at the plate--which, to be clear, always struck me as absurd for a player hitting .325 and winning multiple batting titles--Mauer has indeed become more aggressive. He's swung at 44 percent of pitches this season after never cracking 40 percent in a season previously, which includes career-highs in swings on pitches both inside and outside of the strike zone. Mauer has pulled 31 percent of the balls he's put in play this season, compared 27 percent for his career. However, his rate of "hard hit" balls is 27 percent, which is the second-lowest mark of his career. His rate of "soft hit" balls is 16 percent, which is the second-highest mark of his career. He's tried to change his approach, both in terms of being more aggressive and pulling more balls in the air, but it's not clear that the net result to those changes in a positive one. Basically everything about Mauer's hitting has gotten worse since he suffered the concussion. He's striking out more and walking less. He's swinging through more pitches and hitting pitches softer when he does make contact. Pitchers are also throwing him more strikes, in general, which is to be expected at some point when the league starts to grasp that the .325 hitter has now been a .275 hitter for 18 months. The only saving grace, at least so far this season, is that Mauer has been incredible with runners in scoring position and in high-leverage situations. That's actually nothing new, but the difference now is that Mauer has thrived in those spots while not being good in other spots. He's hitting .432 in high-leverage situations and .397 with runners in scoring position, which is how he's on pace for nearly 100 RBIs and leads the Twins in Win Probability Added despite just two homers. It seems clear that the combination of a normal aging curve plus logging 8,000 innings behind the plate through age 30 and multiple significant injuries, chief among them a concussion in August of 2013, has led to Mauer being a shell of his former self at age 32. Because he's a great athlete with amazing hand-eye coordination who ranked as one of the best all-around players in baseball for a decade he's still able to be a reasonably productive player in his diminished state. However, the shift from catcher to first base was going to take a big chunk of his value away even if his offensive performance stayed constant and instead it has deteriorated rapidly. Perhaps he'll have a resurgence like former Twins teammate Justin Morneau and other prominent hitters have had several years after being derailed by a concussion, but in the meantime he ranks as a below-average player at his position after a decade of ranking as the best player at his position. The hope with Mauer's move to first base was that getting out from behind the plate would help him stay healthier and more durable, enabling him to up his production enough to be one of MLB's better-hitting first basemen in the Joey Votto mold. Short of that, a reasonable expectation was that Mauer's hitting would remain unchanged from his catching days, turning him into a very good but not spectacular offensive first baseman in the John Olerud mold. Instead it's been a worst-case scenario. He's hitting worse than ever at a position with the highest bar offensively, derailing Mauer so far off course from a Hall of Fame path at catcher that he fits into the Mientkiewicz/Loney mold at first base. It's a sad change and one that's been difficult for everyone to wrap their heads around, but based on the information we have about Mauer since his concussion the odds of him returning to the 2004-2013 version seem slimmer by the day. It's important to remember that Mauer struggling after age 30 doesn't take away from what he accomplished through age 30. He was a truly elite catcher, a .325-hitting on-base machine with a strong arm who ranked as one of the best handful of players at his position in baseball history. At the same time, Mauer being a Hall of Fame-caliber player through age 30 doesn't change the fact that he now needs significant improvement simply to be an above-average player at age 32. • He's still not showing any power, but Joe Mauer is doing his usual thing (.299 batting average, .392 on-base percentage, 11/11 K/BB ratio) despite dramatically changing his approach at the plate by being more aggressive early in counts and pulling more balls in the air. Whether it will ultimately lead to a better overall performance remains to be seen since it's tough to improve upon a lifetime .318 AVG and .401 OBP, but the new approach is more likely to generate power. 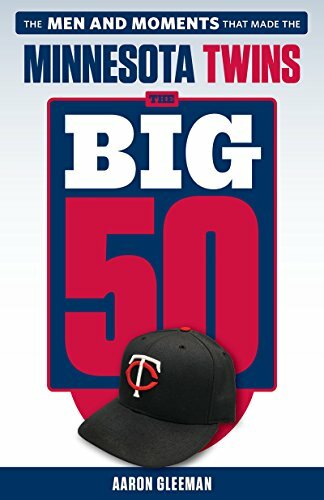 • Mauer is 13-for-34 (.382) against left-handed pitchers this year and has hit .296 with a .368 on-base percentage off lefties for his career. Among everyone since 1965 the only left-handed hitters with a higher career batting average and on-base percentage vs. left-handers than Mauer are Tony Gwynn, Rod Carew, Todd Helton, Larry Walker, and Wade Boggs. So three Hall of Famers and two near Hall of Famers who called Coors Field home. No platoon needed. Keeping the ball in the ballpark has been a career-long struggle for Hughes, so serving up six home runs in four starts certainly isn't a positive thing, but everything else is encouraging and Hughes really didn't start rolling last season until May. • Kyle Gibson continues to be difficult to evaluate because for all the talk of his raw stuff being good he can't generate strikeouts and his control has been poor. Through four starts he has twice as many walks (12) as strikeouts (6) in 22 innings and his career strikeout rate of 5.1 per nine innings in a high-strikeout era puts him in the same category as guys like Scott Diamond, Joe Mays, and Nick Blackburn who couldn't sustain their early success. • Casey Fien returning from a minor injury has really helped stabilize the bullpen after what was a horrendous start to the season. 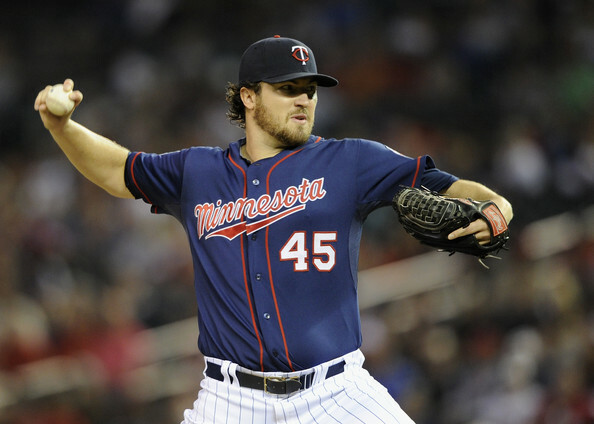 Not only is Fien clearly the best non-Glen Perkins option in the bullpen--he has a 3.47 ERA and 159/31 K/BB ratio in 169 innings for the Twins--counting on him as the primary setup man has allowed manager Paul Molitor to push replacement-level relievers like Blaine Boyer back into lower-leverage roles. • On a related note, the sample size is very small but Perkins looks like his usual, pre-injury self after struggling mightily and then being shut down in September last season. His velocity is up, he's generating swinging strikes, and he's allowed just one run in eight innings while striking out eight and walking zero. Perkins, who's under team control through 2018, has a 2.84 ERA and 332 strikeouts in 317 career innings as a reliever. • Danny Santana hit .319 as a rookie, but his inflated batting average on balls in play, bad plate discipline, and underwhelming track record all suggested he was over his head. Sure enough he's turned back into a pumpkin, hitting .210 with 20 strikeouts and zero walks in 15 games. Santana has 118 strikeouts and 19 walks in 116 total games for the Twins after averaging 91 strikeouts and 23 walks per 116 games at Double-A/Triple-A. That's not the approach of a leadoff man. • Santana "leads" all American League hitters by swinging at 50 percent of the pitches he's seen outside of the strike zone. Kennys Vargas and Torii Hunter have swung at 40 percent of pitches outside the strike zone, giving the Twins three of the league's nine worst hackers. Santana is still very young and has plenty of talent, but there's a reason his rookie success came as such a big surprise after he hit just .273/.317/.391 in the minors. • Ron Gardenhire is officially looking for another managing gig. He hired an agent for the first time in two decades and is said to be "willing to consider virtually any position." He's still being paid by the Twins in the final season of his contract, but Gardenhire figures to be a popular name brought up by fans and media members to replace managers on the hot seat. He has a 612-685 (.471) record, one 90-win season, four 90-loss seasons, and zero playoff wins since 2007. • No. 1 prospect Byron Buxton and No. 2 prospect Miguel Sano are both hitting below .200 at Double-A after injury wrecked 2014 seasons, so don't expect to see that particular cavalry arriving at Target Field anytime soon. However, there's plenty of potential lineup and bullpen help playing well at Triple-A, including Aaron Hicks, Josmil Pinto, Michael Tonkin, and Lester Oliveros. • Right-hander Kohl Stewart, who was the No. 4 overall pick in the 2013 draft and ranked No. 5 on my annual list of Twins prospects this year, has been shut down with elbow problems. 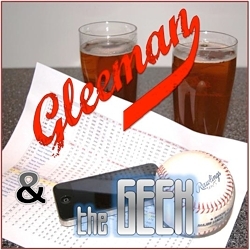 • Joe Nathan needs Tommy John elbow surgery, which at age 40 means his career may be over. 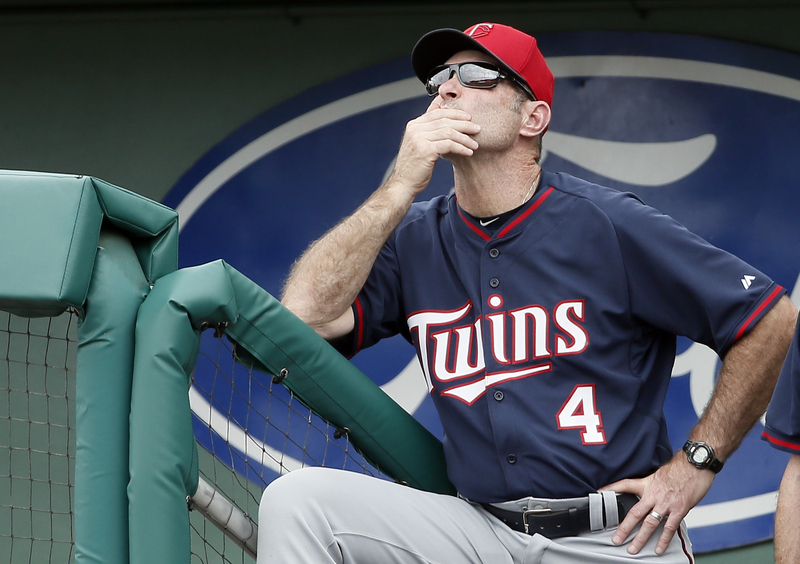 Paul Molitor barely has his feet wet as Twins manager, but one noticeable change from Ron Gardenhire is the willingness to platoon. In his 13 seasons as manager Gardenhire essentially never platooned based on handedness, instead treating left-handed bats like Jacque Jones and Jason Kubel as everyday players despite their inability to handle left-handers and ignoring the potential value mediocre right-handed bats like Danny Valencia had as lefty mashers. Molitor platooned more in his first couple weeks than Gardenhire did in some seasons, regularly benching Oswaldo Arcia and Jordan Schafer against lefties. That's a positive sign in the sense that platooning is a very straightforward, commonplace method of squeezing the most value out of non-stars and putting players in a position to succeed, but in this case the Twins constructed such a weak bench that their platoon options are pretty unappealing. Not playing Schafer against lefties is a good idea, but Shane Robinson is such a weak overall hitter that his right-handedness barely makes a difference. Not playing Arcia against lefties is also a good idea, at least in the short term, but if the Twins still hold out any hope of him developing into an everyday player he'll need playing time versus lefties eventually and Eduardo Escobar, while better than Robinson, isn't exactly an ideal platoon-mate for a corner outfielder. Mostly, though, it's just nice to see a manager willing to embrace a common, effective tactic after more than a decade of watching lefties flail away against left-handed pitching, potentially useful righties cast aside because they struggled in everyday roles, and batting orders remain unchanged regardless of the handedness of the opposing pitcher. And if the Twins' bench ever contains better options Molitor could do some interesting things with the lineup. It'd be great to have nine everyday players and just trot them out in the same lineup spots no matter who was on the mound, but it's hard to find teams that wouldn't benefit from at least some platooning. Nearly every left-handed hitter in baseball history with a sizable track record has fared better against righties than lefties, often to an extreme degree. Because of that, with a lefty on the mound even good left-handed hitters are often worse than mediocre right-handed hitters. On average those six left-handed hitters have an .843 OPS versus righties and a .699 OPS versus lefties for a collective decrease of 17 percent and everyone but Denard Span sees their OPS drop more than 125 points. Those decreases are larger than typical across MLB, but in general lefties tend to be 10-15 percent worse versus lefties. Of course, some lefty bats are good enough overall that they warrant keeping in the lineup against lefties even with the decreased production. Put another way: Mauer's production against lefties drops 18 percent, but he's still decent with a .749 OPS. However, not many lefties are as good as Mauer overall and so most warrant benching at least semi-regularly. Gardenhire obviously didn't agree. Jones hit .230/.278/.350 off lefties, yet Gardenhire played him every day and kept him leading off. Kubel hit .233/.305/.375 off lefties, yet Gardenhire played him every day and kept him in the middle of the lineup. You get the idea. It's possible that Arcia will improve versus lefties and/or become productive enough overall that he's worth playing every day and because he's still just 24 years old it's certainly worth investing some more time into finding out. More likely is that he's ultimately a platoon or quasi-platoon player, which is less a knock on Arcia specifically and more just the way things tend to go with good but not great left-handed hitters. Considering his poor defense Arcia needs to put up big numbers to be worth having in the lineup at an offense-heavy position. So far he's hit .221/.262/.340 off lefties, which is 25 percent worse than his .249/.322/.489 line off righties. Even if Arcia gets better versus righties and turns that 25-percent drop versus lefties into, say, a 15-percent drop it shouldn't be all that hard for the Twins to find a random right-handed hitter capable of better against lefties. Aaron Hicks, while hugely disappointing overall, has posted a .758 OPS off lefties in the majors and has always hit lefties much better than righties in the minors. Hicks may never develop into a quality regular, but he's already a quality platoon option. With a lefty on the mound he's a viable center fielder and/or better than Arcia offensively and defensively in left field. And that's the magic of platooning, which turns useless into useful by separating strengths from weaknesses. Molitor has shown the mindset required to improve a lineup via platooning, but the Twins need to actually give him the pieces to make those moves worthwhile and a four-man bench of Robinson, Escobar, Chris Herrmann, and Eduardo Nunez doesn't qualify. Still, after 13 years of learning to view hitters strictly through Gardenhire's binary "everyday player or not" lenses it's refreshing to consider how open-minded managing might take better advantage of useful but flawed options.